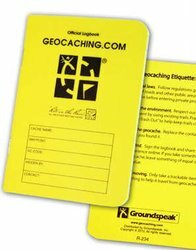 Geocache.com Official Medium RITR - 24 Sheet Logbook [R-234] - $4.79 : Trail Explorers Outpost, Keeping the Adventure Alive! The front cover has the Geocaching.com logo, a place for the cache name, waypoint, GC code and contact information. The back of the logbook has basic Geocaching trail etiquette along with general information about the game. Inside are 24 lined sheets of "Rite in the Rain" all-weather paper designed to shed water in any weather condition.